So we had invited a couple of our Dutch friends, Kirsten and Robbert, over for dinner. Chicken with oyster sauce and cashews with glass noodles (yum!). Even though writing that just made me hungry, I won’t be discussing the dinner any further (seriously though, try what I just mentioned). Upon arriving, Trudy’s good friend Kirsten told us that she had a ‘surprise’ for us, but she needed the laptop to show us what it was. Unsure of quite what to expect (A funny video of Australians being idiots in Holland? The latest episode of Australian Masterchef? [they really do play this in Holland – weird, right?]). She was tapping away at the laptop, and had loaded up a video from a Dutch news site. “You can understand Dutch a little, right?” Kirsten asked us. We agreed apprehensively, yes we could understand a LITTLE, not really enough to follow exactly what’s going on most of the time. We all gathered around the Laptop like it was a wireless radio show from the 50’s, she hits play and we’re met with two Dutch women chatting away on a show called Koffietijd (Coffee Time). 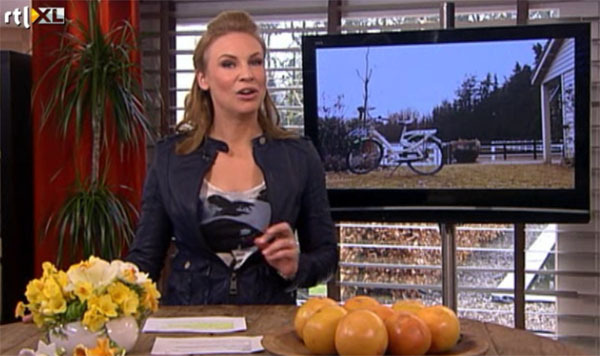 It’s a massive ‘breakfast’ TV show in Holland that plays nationwide and is very popular. The segment of the Dutch women ends, and it flicks to a blonde presenter. Lo and behold, the presenter mentions Kirsten’s name, and then starts talking about “Trudy” and her boyfriend “Tom”. “Whaaaaaat?” we’re thinking. What the hell is going on? Then we start to see these images flash up on the screen. Is that a picture of.... Trudy? It sure is! Did she just say my name? What's Trudy doing on there? A new bike!!! Sweeeeeeeet! But how...? What happened was a couple of weeks ago, Trudy’s bike got stolen from the front of our apartment. Trudy loved the bike, so as you can imagine we were disappointed when it went walkabout (a common occurrence for bikes living in The Netherlands). When Kirsten heard about this however, she wrote in to ‘Koffietijd’ and told them the story of the bike, because what Koffietijd do is give away a new bike every morning to a lucky winner. So the story went that we had just moved to The Netherlands, and we had our new bike stolen from under our very noses! What a bad welcome to Holland! Kirsten implored Koffietijd to show Trudy the true meaning of the friendly Dutch spirit and give her a new bicycle! Weeks went by, so Kirsten assumed that Koffietijd had ignored her letter. The suddenly and without warning, Koffietijd played the story (with the picture of Trudy that Kirsten had sent in) – and she won the new bike! It’s fun being an Aussie in The Netherlands! PS: If you want to see it live yourself, then check it out here – the section with Trudy starts at around 41:40. Cool story Tom! You’re the first Aussie koffietijd celeberties. Talk to you soon! Thanks Lisa 😀 Yeah, she’s pretty stoked! Awesome! I never win anything, and you win a new bike! When did it air? Or do you have the link to the show? Ok, with the date I found it: http://www.rtl.nl/xl/#/u/7a19291e-c788-3f7c-85d8-dc04e7ad2a6f.